HomeCollecting AdviceThe birthday card that transforms into a 7″ record player! What to get the vinyl lover that has most things… we love this! Email, texts, even automated Facebook messages have been killing the good-old fashioned birthday card. The threat of digital for the physical artefact is something we can empathisee with – so it’s nice to see some solidarity between the birthday card and vinyl record with the launch of Recards. Essentially it’s a birthday card accompanied by a 7″ record. 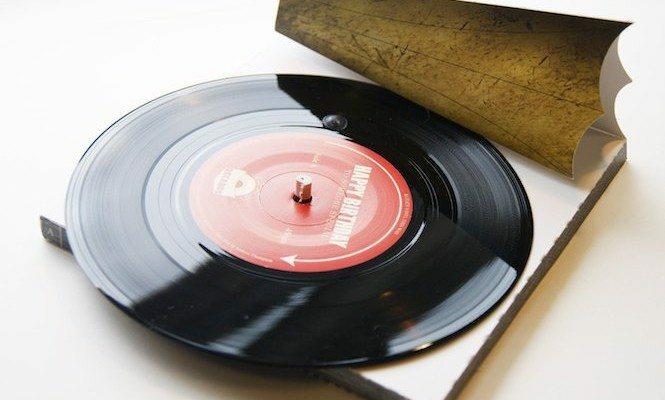 The idea is that, by following some ‘simple’ steps, you can transform the birthday card into a record player. The starting point is to build a cardboard plinth by tearing off and connecting perforated bits. Then by rolling up some more card, a spindle is created which slots into the centre of the plinth. Next using a 10p coin or something similar, the attached needle is weighed down into the grooves of the 7″. Rotating the record with a finger, the birthday message plays out. Well, that’s the idea anyway. As YouTube user Techmoan demonstrates in this video, it’s not as easy as it sounds although as he concludes it’s all a bit of fun and in that sense the perfect present. Visit Recards to order one – there’s also a Christmas edition to snag. Vintage Music Memorabilia – what rarities are in our current ‘Top 3’? Oh, You Pretty Things! Incredible new David Bowie rarities collection just in….